ABNL has received a sum Rs.1,664 crore from the stake sale, valuing BSLI at Rs.7,235 crore. ABNL continues to hold the 51% controlling stake in BSLI. Aditya Birla Nuvo Limited (ABNL) announced the completion of the transaction, whereby Sun Life Financial has increased its stake in the life insurance joint venture, Birla Sun Life Insurance (BSLI) from 26% to 49%. 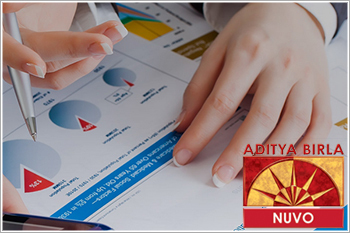 Aditya Birla Nuvo Ltd is currently trading at Rs. 850.75, down by Rs. 2.25 or 0.26% from its previous closing of Rs. 853 on the BSE. The scrip opened at Rs. 869 and has touched a high and low of Rs. 869 and Rs. 847.25 respectively. So far 129931(NSE+BSE) shares were traded on the counter. The current market cap of the company is Rs. 11108.01 crore. The BSE group 'A' stock of face value Rs. 10 has touched a 52 week high of Rs. 1137.58 on 08-Jan-2016 and a 52 week low of Rs. 685 on 29-Feb-2016. Last one week high and low of the scrip stood at Rs. 860.25 and Rs. 808.5 respectively. The promoters holding in the company stood at 57.18 % while Institutions and Non-Institutions held 28.24 % and 14.58 % respectively.